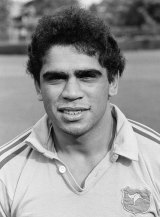 Regarded as one of the finest players Australia have ever produced, Mark Ella won 25 caps for the Wallabies between 1980 and 1984 - 10 of them as captain - and was described by team-mate David Campese as "the best rugby player I have ever known or seen". A fly-half with exceptional skill, he was a star of the famous Australian schoolboys squad that toured Britain undefeated in 1978 and he returned to the United Kingdom in 1984 to mastermind the Wallabies' Grand Slam tour of the home countries, after which he never played for his country again, retiring at the age of 25. His coaching career included spells with the Australia Sevens team - who he steered to abronze medal at the 1998 Commonwealth Games in Kuala Lumpur - before returning as an assistant in 2008. He was made a member of the Order of Australia in 1983 having been voted the Young Australian of the Year in 1982. In 2005 he was honoured as one of the inaugural five inductees into the Australian Rugby Union Hall of Fame and in 1995 he was inducted into the International Rugby Hall of Fame. After hanging up his boots, Ella pursued a career in media, writing articles for The Australian, The Sunday Telegraph and The Daily Telegraph as well as commentating on ABC Rugby. Now a marketing and public relations specialist, his brothers - fullback Glen and centre Gary - also earned international honours and together they were stalwarts of the Randwick club in Sydney.